Model: 24023 Black. Opened for photography. 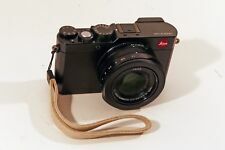 New Leica Digital Compact Leather Wrist Strap #18792 - Close-Out Pricing! New Leica Digital Compact Leather Wrist Strap #18792. Originally made for the Leica C.
This strap is made of limited edition buttery soft wood grain engraved cowhide. It is lightweight yet strong, ages gracefully and molds to your body- no need to break it in. It can be worn around one or both shoulders. Gain a larger, steadier, and more secure grip on your M10 with the addition of this black Hand Grip from Leica. This strap is made of limited edition buttery soft black paisley engraved cowhide. It is lightweight yet strong, ages gracefully and molds to your body- no need to break it in. It can be worn around one or both shoulders. The Leica handgrip attaches to the digital Monochrom by replacing the normal base plate and is is especially useful when using the high-speed lenses of the digital Leica M system. The item pictured is the actual item for sale. This strap is light yet strong. Bottom leather: 2/3 oz cowhide. Top leather: 2/3 oz cowhide. "THE QUINTESSENTIAL ROCK N ROLL STRAP! "Maybe this guitar strap will enable this person or who ever wins to play on the level he wishes". The Finger Loop for Handgrip M from Leica is a sturdy rubber finger loop that attaches to the Handgrip M or Multifunctional Handgrip M and allows for improved handling of the Leica M Digital Rangefinder. Leica Lettering is Embossed on the strap not printed. The length can be adjusted to suit your needs or preferences. The strap is designed to match the optional T-Flap and T-Snap accessories. Colour: as in first picture . Not to be confused with the other M strap I have listed that is new, the photos look similar but this is used, the other is new. LEICA 19505 HANDGRIP LEICA Q (TYP 116). LEICA 14496 HANDGRIP/ HAND GRIP M. LEICA 14647 FINGER LOOP SIZE SMALL. LEICA 14495 MULTI FUNCTIONAL HANDGRIP/HAND GRIP M. ITEM IS NEW. The item pictured is the actual item for sale. Model: 18818 Orange. Leica T Wrist Strap, Silicon Orange Features. NEW LEICA M Camera Nylon Strap 14312 with Shoulder Pad Shipped with USPS First Class Package. (Third party Made not Leica Product). Leica logo is Embossed on the strap not printed. The strap is adjustable to a maximum length of 42'. In the case of factory defects, if available, we will replace the product for you. We do our best to process as quickly as possible. For this reason, we are typically unable to honor cancellation requests. Leica carrying strap is crafted from the finest calfskin and features an embossed Leica logo. For this reason, we are typically unable to honor cancellation requests. In the case of factory defects, if available, we will replace the product for you. 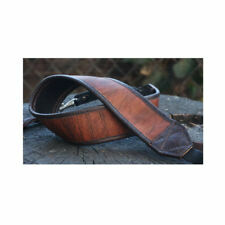 The strap is widely adaptable in its length through three holes on each side of the strap. In the case of factory defects, if available, we will replace the product for you. We do our best to process as quickly as possible. Made in Germany, the rope features Italian-made leather details. For this reason, we are typically unable to honor cancellation requests. In the case of factory defects, if available, we will replace the product for you. The Leica CL stands for classical style and tradition. For this reason, we are typically unable to honor cancellation requests. In the case of factory defects, if available, we will replace the product for you. Carrying strap. Wrist strap. For this reason, we are typically unable to honor cancellation requests. In the case of factory defects, if available, we will replace the product for you. We do our best to process as quickly as possible. In the case of factory defects, if available, we will replace the product for you. We do our best to process as quickly as possible. For this reason, we are typically unable to honor cancellation requests. In the case of factory defects, if available, we will replace the product for you. We do our best to process as quickly as possible. The carrying strap is a perfect match for the Leica X1. This stylish and practical accessory is made from high-quality smooth calfskin and features the embossed Leica Logo in its exclusive design. For this reason, we are typically unable to honor cancellation requests. With the wrist strap attached tothe Leica C and hanging out of the C-Clutch, it makes a casual carrying strap for the fashionable C-Clutch. For this reason, we are typically unable to honor cancellation requests. Neoprene neck strap for the Leica SL (Typ 601), Leica S (Typ 006/007), Leica S2 and Leica S2-P. In the case of factory defects, if available, we will replace the product for you. We do our best to process as quickly as possible. The strap is widely adaptable in its length through three holes on each side of the strap. For this reason, we are typically unable to honor cancellation requests. In the case of factory defects, if available, we will replace the product for you. In the case of factory defects, if available, we will replace the product for you. We do our best to process as quickly as possible. For this reason, we are typically unable to honor cancellation requests. The design and colours of the carrying strap are perfectly matched with the T-Snap und T-Flap. Another highlight is the ideal balance of stretch and stability afforded by the mixture of silicones. The length can be adjusted to ensure that you can carry your Leica T safely and comfortably wherever you go. We will happily work with you to find a solution to any problem.